How does JCWIFI Internet service work? JCWIFI will mount an antenna on your house/building that wirelessly connects back to one of our broadcast towers, the antenna must have clear line of sight to the tower. There will be a cable that runs from the antenna into the house that will connect into a POE (power over Ethernet) adapter. There will then be a cable from that POE that connects to your computer or wireless router. How do I connect multiple computers/devices to the internet? You will need to purchase your own wireless router. The router will provide wireless access in your house and split the connection to your wireless devices. What's the difference between the Service packages? The Bronze package is high speed internet for basic usage such as browsing the web, Facebook and emailing. Video streaming of any kind will not work on this package. The Silver package is our mid-range speed package. This package can do everything the Bronze can and more, you can watch You Tube and Netflix on this package as well as do online gaming. The Gold package is the fastest package we offer, you can do multiple video streams on this package. Amazon Prime video streaming needs this package to function properly. To reboot your antenna locate the small black box, it is only 2" by 3" long, has 3 cables that connect to it and has a little light on it, this is normally on the floor near your wireless router or main computer. 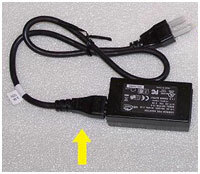 Unplug the power cable only (larger black cable that does not look like a phone cable) from the power outlet or the small black box and leave it disconnected for 3 to 5 minutes. After you connect the power back to the little black box make sure the light came back on and wait 1 to 2 minutes before trying the internet. Are there data usage caps? No, JCWIFI does not bill based on usage. I am receiving messages on my JCWIFI email account that I have exceeded my quota, how do I fix this? You need to clear out your inbox on the mail server. To do this you will need to go to our website www.jcwifi.com and click on the link for webmail. You will need to log in using your full email address and email password, if you don't know your password you can call the office to reset it. Once you are logged into your mail account on the server click on Inbox along the left hand side. You will need to delete all of the messages that are in your inbox and then also empty the Deleted Items folder. You can right click on the Deleted items folder and select Empty Folder to clear it out completely. You should start receiving emails shortly after these steps are completed. *Note: Any emails sent during the time your mailbox is full will not come through and will need to be resent. How do I reset my router password? If you have forgotten your router password there are 2 ways to reset or retrieve it. 1. On the back of the router there will be a reset button, you will need a pen to push it. Push the reset button and hold it in for 30 seconds. This will reset the router to factory defaults and clear out any/all configurations in the router including the password. 2. With a computer that is able to connect to the router, you can log into the router configuration page. This is done by using a web browser and typing in the routers IP address, which can be found in the routers book or by searching google for the IP of your brand of router. You will need the routers username and password to log in which can also be found in your router book or by searching the router brand on google. Once you are logged into the router you will be able to change the routers wireless password. What are the times for internet support? The office is open Monday – Friday 8:30a.m. to 5:00p.m. We do offer after hours support for internet related issues until 10:00p.m. nightly. I am getting a new roof put on/remodeling. What do I need to do? Call the office to schedule a billable service call to remount your outside equipment. Yes! Refer your friends and receive half off of your next months bill. Can I move my JCWIFI service to a new address? Yes. Call the office and we will check if your new location is in our coverage area and set up an appointment to install your new location. The move fee is $70. Can I change my package after installation? Yes, we can switch you to any speed package supported by the tower you are connected to. What payment methods do you accept? Can I pay my bill online? We accept cash, personal checks and credit/debit cards. At this time we do not offer online bill pay. I rent, can I get your service? Yes, we do require landlord's written permission at the time of install. Wireless Internet Service provides high-speed access to the internet without reliance on a phone line. Similar to a radio signal, data is transmitted to and from your computer using antennas. You do not have to wait for your modem to dial up. Just open your internet browser, and you're quickly connected. Why should I use wireless technology? You should use this technology if you want or need reliable high speed internet access. Is this like satellite service? No. Rather than communication from one antenna to another with several feet or a few miles, such as wireless internet service, satellite service bounces a signal out of the atmosphere to an orbiting satellite and then back to a central location. With satellite service, weather can become an issue, as can the sheer distance the signal has to travel. What kind of equipment does JCWIFI provide? An antenna mounted outdoors for long distance communication to send the wireless signal. 100 feet of cable to connect the antenna to the computer. Is wireless internet service safe? In most cases, the system's transmitter will emit less power than a cellular telephone. Antennas are usually installed at least 12 feet above the ground. Yes, Information traveling from your computer to our first tower is encrypted using industry standard methods. Once your information arrives at our tower, the data is encrypted using secure proprietary technology; however, for added security, a customer may choose to secure the router from within their home/office. Can anything hamper my ability to receive service? A line-of-site is almost always needed for the connection. Although normal weather conditions such as rain and lightning are not an issue, obstructions such as buildings, trees or hills can affect service if an antenna isn't installed high enough. Distance can also affect service. Some customers can receive service from as far as nine miles away. Just call 866-620-3725 or fill out one of the contact forms on this website. Our friendly, professional installation crew will take care of installing everything for you. All you need is a computer with an Ethernet card. If you don't have an Ethernet card, they're available at an additional cost.